Did you know that you can use your MYOB program to produce professional looking invoices? There is a functionality within almost all versions of the program which allows you to create customised forms for designed invoice layouts which can be printed to plain paper or your own pre-designed stationery. The invoice layout function works like any regular desktop publishing program – so if you’re familiar with how to use these then you’re one step ahead already. Another menu will appear and from it, you select what type of form you wish to customise. The text fields are what you use to describe the information that will appear on the invoice and in a font and style that suits your artistic taste. The data fields are auto-filled by MYOB, having extracted the details from the database. 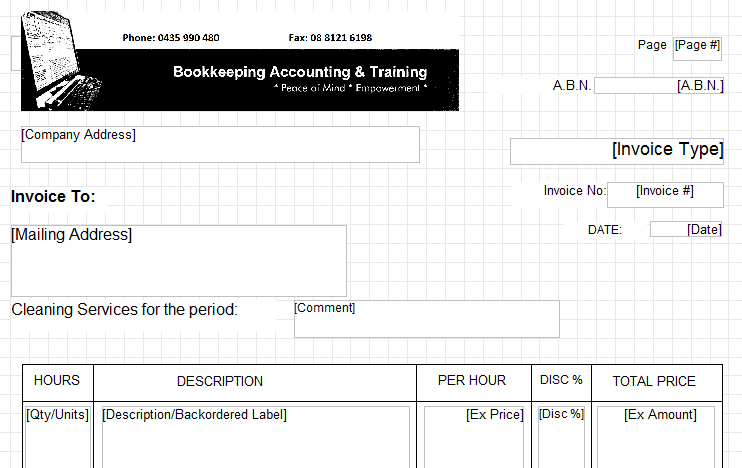 For example, you want to include your ABN on your invoice. You have a “text” field which you manually label “ABN” and to the right of it, you have a “data” field called [ABN]. All fields in square brackets are data fields while the rest are text fields. The two combined will produce the words “ABN 123 456 789” on your invoice. The number will be extracted from the ABN you input in your Company Setup information. This principle follows all throughout the layout function. You can change the font and size, add or remove columns, include your own slogan or website address, add images from files stored on your hard drive – pretty much everything you need to design a professional looking invoice. Once you’re done, you simply “Save” the invoice layout. You can either give it a new name or save over the top of the pre-designed invoice layouts that come with the program. This is a very nice feature of the MYOB suite of programs. If you would like help with how to get the most from your MYOB program, whether you’re in Adelaide or anywhere in Australia, we can help you. If you’re local we can arrange a home or office visit. If you’re elsewhere, we can train you with one-on-one personal attention using the internet.